A brave display by Tullamore Seconds saw them just edged out by Portlaoise Firsts in the Provincial Towns Cup in Portlaoise last Sunday. With the weather wet and windy it was a day for grinding it out and the game could have gone either way. Portlaoise had a heavy pack with a good lineout and a very effective maul. Tullamore needed to move it wide with their lighter and younger side. Over the full game Tullamore shaded possession but despite a brilliant effort they came up just short. Portlaoise by virtue of scoring the only try probably just about deserved victory but it was oh so close. Tullamore had the aid of the wind in the first half but found scores hard to come by. 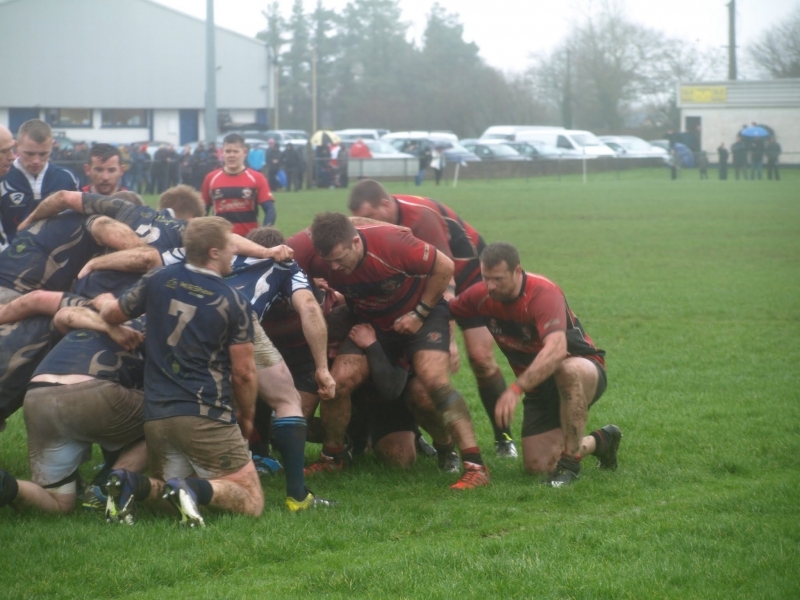 The home side defended well and Tullamore never really threatened the try line. After 27 minutes Odhran McIntyre gave Tullamore the lead with a good penalty from 30 metres. Portlaoise started to use their maul to great effect and after a lineout 5 metres out Mark Sherlock crashed over for a good try. Tullamore went back into the lead with another McIntyre penalty just before the break for a 6-5 score. The home side started the second half well and in the 54th minute Andrew Collier kicked a 20 metre penalty for an 8-6 lead. Tullamore actually played their best rugby against the wind. Time and again they drove into the Portlaoise half only to be sent back by a wind assisted kick. In the last quarter Tullamore camped in the home 22 and were barely denied on a couple of occasions. Portlaoise kept conceding penalties but against the wind Tullamore had to keep running the ball. Terrific attacking up the middle was only stopped by great defence by Portlaoise. Tullamore possibly should have moved it to the wing more until time ran out on a brave Tullamore display. This was a proper cup match with great intensity and no little skill from both sides. Up front Kevin Browne was exceptional for Tullamore with great support from Senan Carroll in particular, Matthew Murphy and Adrian Hanley. In the backs Declan Byrne, Odhran McIntyre and Cormac Moloney gave their all. The whole Tullamore panel gave it everything for the cause and that is all you can ask for.